APEX Farm Management software is a basic data management solution that plays a significant role both before a producer goes to the field and after each operation is complete. Like the producers who put money into their operation to get money out, data has to be put into the GreenStar™ system to get data out. Before going to the field, producers can set up operational information in APEX and save the setup data to their USB drive. Once the USB drive is inserted into the GreenStar display, all associated menus are pre-populated. This saves any downtime that would have been spent manually entering farm and field names while sitting in the field. Additionally, setting up data in APEX ensures the consistency of such names when managing multiple operators or systems throughout the growing season. After each operation is complete, the operator can unload the field data into APEX. 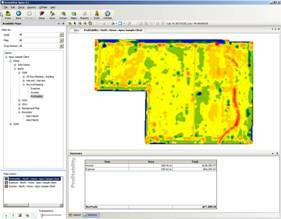 After the data is unloaded, maps and reports can be generated so the producer can easily visualize how previous management decisions impacted production and what improvements can still be made. APEX offers producers the basics — the ability to organize and analyze both historical and current field data. APEX software is an orderable bundle. As technology becomes more sophisticated and advanced, there are times when information is deemed rather outdated and ineffective after only one year. However, when it comes to agricultural field data, many management decisions are based on historical trends. By using APEX, producers can visualize the farming practices and productivity of past years and use that information to make important decisions for the next production year and beyond. The intended outcome of such decisions is not only to maximize profit, but also to maximize efficiency and become more environmentally safe. APEX is the solution producers can use today to improve their tomorrow. To provide producers with the newest features and functions, the APEX Farm Management software can be updated on a regular basis through APEX Live Update. With this feature, producers do not have to worry about keeping up with e-mails, checking a website, or downloading information from a CD to update their program. They can enable the Live Update feature to check for APEX updates on a daily, weekly, or monthly basis, provided the user has an active internet connection. APEX Live Update works best with a high-speed internet connection, as updates can take a considerable amount of time when downloading through a dial-up connection. Navigation within the APEX Farm Management software is simple and easy. APEX allows users to filter what information they would like to view in the map tree. Several areas within APEX are based on a tree structure where the user begins with the client name and keeps expanding the tree structure, ending with a specific map layer they want to see. Additionally, the user can manage and arrange the map layers they are viewing by using the map layering tools below the map layers' window. 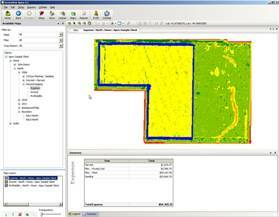 APEX™ software has the capability to identify individual loads by name. This feature allows users to specifically designate load names for increased flexibility and traceability from specific locations. Load names can be added, modified, and deleted. Users also have the ability to change a load destination in APEX. This feature allows users to specifically designate load destinations for increased flexibility and traceability from specific locations. Load destinations can be added, modified, and deleted. APEX enables growers to edit loads that are given the wrong load name, load destination, and/or load number even though the crop area in the field of which the load was created is correct. For example, if one load (truck - the load name, 44 - the load number, and grain bin - the load destination) had been given a load destination of grain bin but was really sent to the elevator, the grower could edit the load destination (changing it from grain bin to elevator) in the load properties. APEX enables growers to edit loads when crop area from the field is given the wrong load name, load destination, and load number. For example, if one variety test plot of a field was one load (truck - the load name, 42 - the load number, and grain bin - the load destination), but the operator did not change the next load of a second variety test plot, (truck - the load name, 43 - the load number, and grain bin - the load destination), the grower could edit the load in the load contents. APEX offers a load summary detail report filter. This filter allows users to filter by harvest type, load name, load number, and load destination. APEX Record Keeping enables recorded data to be used to make sound business operating decisions. Once pricing information is applied, users can generate profitability maps and enhanced decision making reports.